Through his fur trade the original John Jacob Astor had amassed a fortune of nearly a quarter of a million dollars by 1800. But his genius in real estate would make him the first multi-millionaire in the country. During the Revolutionary War the Bull's Head Tavern sat on Broadway, on the block just north of St. Paul’s Chapel. The area was open and mostly undeveloped and the grounds around Adam Vanderburgh’s tavern were shaded by spreading trees. As the city inched northward the tavern disappeared, replaced by fine brick homes of New York’s wealthy. Astor owned one of these, at the corner of Broadway and Vesey, which he advertised for rent in The New York Gazette in 1813. The ad doubtlessly infuriated his elite neighbors. To let, for one or more years, a pleasant situation and an excellent stand for a drygoods store, the corner house of Vesey Street and Broadway. Inquire of John Jacob Astor, corner of Pearl and Pine Streets. As the years passed Astor envisioned a grand hotel on this most fashionable of blocks. In 1830 he began purchasing his neighbors’ mansions—John Rutherford’s home; the house that had belonged to British officer Colonel Axtell then home to Lewis Scott; and Senator Rufus King’s mansion. Finally he had them all except John G. Coster’s house. Coster was not only quite wealthy, he was quite attached to his corner home and had no intentions of selling it. Finally, out of frustration, Astor approached Coster with an offer he could not refuse. If Coster would produce two friends, Astor would choose one of them to put a value on the Coster property. Whatever that amount was Astor would add $20 thousand to it and write a check on the spot. John Coster agreed and Astor was forced to pay $60,000 for the house—about $1.5 million today. The cornerstone was laid on the Fourth of July that year. It was a momentous event with the mayor, Cornelius W. Lawrence, presiding and the militia parading up Broadway to the site. A silver tablet bore the names of John Jacob Astor and the architect, Isaiah Rogers. Inside was a picture of Lafayette, a picture of New York and copies of the newspapers of that day. The opening was attended by press from Baltimore, Boston, Philadelphia and other cities. The New Yorker said the interior was of a “style of unostentatious richness and severe simplicity.” Custom-made black walnut furniture sat among marble columns on blue-and-white marble mosaic floors. A New York reporter remarked that New Yorkers must now know how Romans felt when they first saw the completed Coliseum. The hotel introduced travelers to the most modern innovations. At a time when most houses still relied on candles, it had its own gas manufacturing plant that supplied gas lighting throughout. 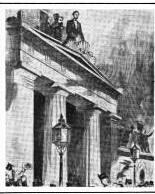 The New York Constellation reported that “The house was lighted by this gas everybody is discussing.” The unfamiliar technology proved a bit dangerous to some guests. Rather than turn off the gas jet, these visitors would blow out the flame, as they would a candle, with the result that several guests were asphyxiated in their sleep. A steam engine in the basement ran a pump that provided water to all floors and powered machinery in the kitchen and laundry. Reservoirs in the attic provided running water to 17 bathing rooms and two showers. Each floor had hot and cold running water as well as water closets. The indoor plumbing alone was considered miraculous. In the basement was a printing press for the printing of daily menus. There was an innovative system of bells and individualized door locks. 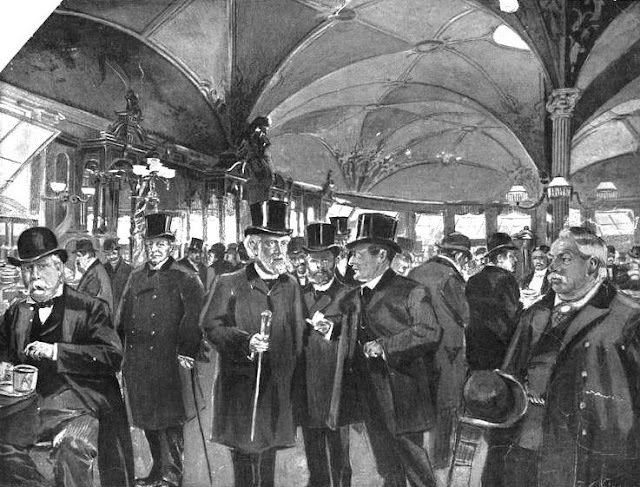 For gentlemen guests there was a grand dining room 108 feet long and smaller elegant dining rooms for women and their male escorts. The hotel offered a reading room, a bar room, an oyster cellar, smoking rooms, barbers, hairdressers, a drugstore, tailors and boot makers. A decade after opening, Astor made a change in the hotel that would have long-lasting effects. The central courtyard with its fountains and trees was enclosed under a great rotunda. Here a richly carved bar was installed and the Astor House’s “free lunch” was served to generations of working New Yorkers. Pierce’s name would be added to the list of White House residents to stay at the Astor House: Andrew Jackson, Abraham Lincoln, James Garfield, James Polk, Martin Van Buren among them. The Prince of Wales, the Grand Duke Alexis, the Prince de Joinville, Louis Kossuth, Horace Greeley and Admiral Farragut were guests. Sam Houston, Jefferson David, Henry Clay and Charles Dickens slept here. When Jenny Lind stayed here, adoring crowds unleashed the horses from her carriage and pulled it from Castle Garden to the hotel by hand. But Daniel Webster was perhaps the name most closely associated with the hotel. Webster would stay at no other hotel and Stetson always vacated the finest suite in the house upon hearing of his arrival. 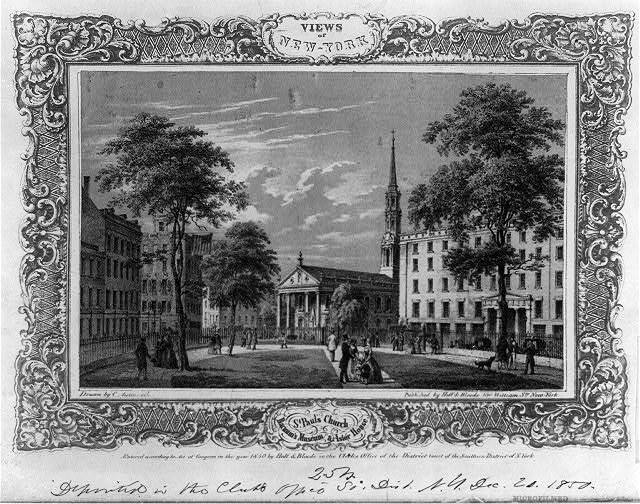 Webster wrote to a friend in 1849 "If I were shut out of the Astor House I would never again to go New York.” Throughout the years Webster never paid for his rooms—a parlor, dining room and bedroom--despite his repeated attempts. The following day Webster said good-bye to Charles Stetson. According to The New York Times he said “Farewell, old friend. We have known and loved each other for more than thirty years. You will find a little present from me in the office.” Two weeks later Daniel Webster was dead. Charles Stetson would have no one else sleep in the suite of rooms used by Webster. He turned two of the rooms into a ladies’ dining room and took the bedroom for himself. Harper's Weekly published a drawing of Lincoln addressing the crowds in 1861 from the entrance pediment. In 1906 a “ghost dance” was held in the ballroom. The ball celebrated the early days of the hotel and only those families who were around in the 1830s were included. “Its invitation list is to include the old-line aristocracy of New York, and its tone is to be exclusive,” said The Times. The guests, including Roosevelts, Hamiltons, Fishes, Clinton, de Peysters, Schuylers and Schermerhorns, were instructed to wear only costumes from 1836. The grand entertainments and the luncheons under the rotunda would not last much longer. On May 3, 1913 signs were posted in the corridors announcing that the hotel would close on Thursday, May 29. The hotel was owned by feuding cousins William Waldorf Aster and Vincent Astor—Vincent owning the southern half and William the northern. Vincent Astor had sold his share of the property when impending subway excavations threatened its stability. Obviously, the other half would have to go as well. Albert C. Kaufmann had been head waiter of the hotel for nearly 45 years when the notice was made. He reminisced to a Times writer about the notable men he had served. General Grant had a favorite table overlooking St. Paul’s and had a “weakness for roast beef.” Chester A. Arthur preferred lamb chops and Grover Cleveland’s favorite was mutton chops. Like Grant, Garfield always ordered roast beef. 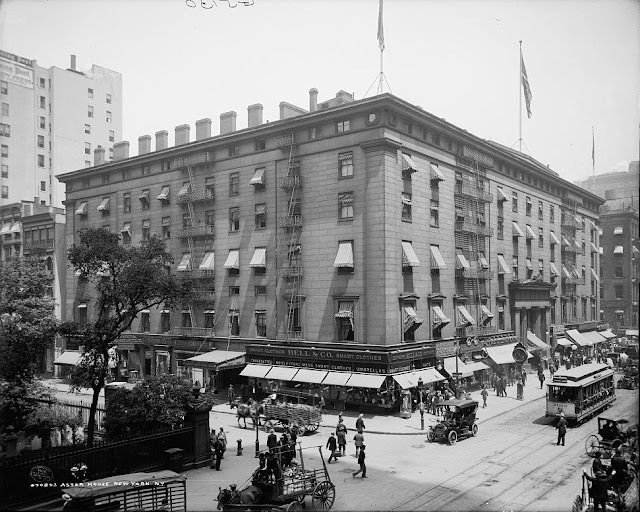 On May 29 Vincent Astor received a petition with over 5,000 signatures; a desperate plea from New Yorkers to save the venerable hotel. Astor was unmoved. On June 10 the auction of the furnishings began. Along with the items was the 108-year old Chinese bridal bed, a famous fixture of the house. Carved of ivory with inlaid wood, it was said to have originally cost $2,500. Thanks for this lucid and thorough account of a demolished New York City landmark. 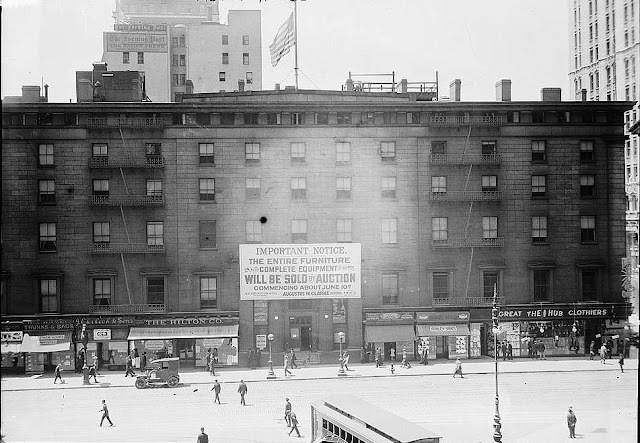 Really a great informative post..Very glad to know about these old New York hotels.. 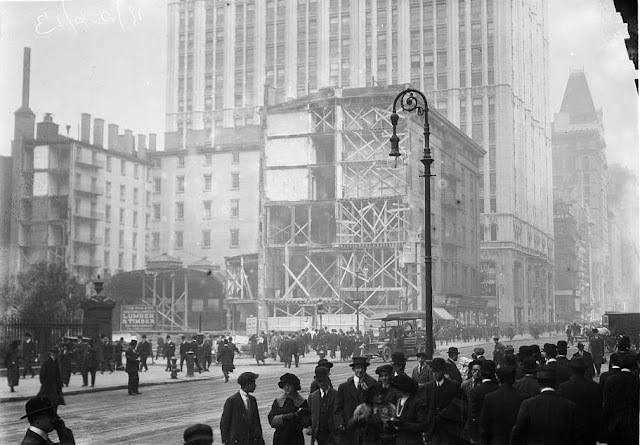 I had always read that subway construction (for the BMT Broadway line) doomed the building. Was it possible to save the building during subway construction? Hi, sorry I must have mixed up my information on the ASTOR HOTEL in MANHATTON, NY because I read online information that stated there was a farm on top of the ASTOR HOTEL for the customers Convenience. I also seen photos of the inside and outside of the HOTEL as well.